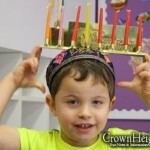 Ithaca, NY — Chabad Shluchim living in remote places or cities where there is no Jewish school, have long contended with schooling their children at home or parting with them at young ages, so they can get a traditional education. A newly developed online school now gives these children the benefit of a classroom situation where they daily interact with classmates–children of other shluchim, and a teacher, at home. 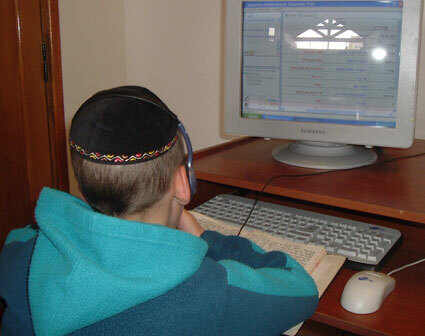 The Online School for Young Shluchim, established by the Shluchim Office, a project of Merkos L’Inyonei Chinuch, the educational arm of the Chabad-Lubavitch movement, provides Jewish children with a comprehensive Jewish education and the opportunity to meet and socialize with other children of similar background. Designed specifically for the children of Chabad Shluchim who often live in cities and countries where there are no local religious Jewish schools, the School’s classes range from first through eighth grade. Scheduled to accommodate different time zones and three languages–English, Yiddish (a spoken language among many children of Shluchim) and Hebrew, the School’s goal is to equip the students with the necessary education and skills to eventually integrate into a regular Jewish high school curriculum. 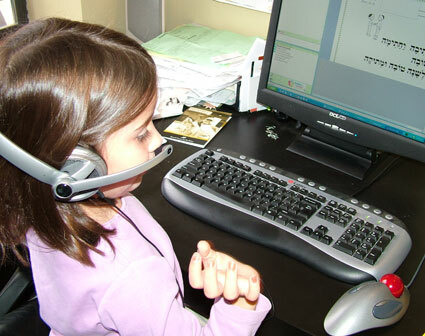 Every day at a set time, Devorah and her classmates at the Online School enter a password and plug in their camera equipped headsets to access their online classroom. The screen acts as a classroom and the students are able to listen, interact and ask questions through their headset. Instead of raising their hands, they merely click the control button on their key board requesting to be called on, or simply type in their questions. Through their cameras they can actually view their teacher and fellow classmates. The teacher can even call students up to the board to demonstrate their skills. During recess, the students enjoy open microphones and are able to interact freely with each other. Mendel Levertov, age 10, of Santa Fe, spends four hours a day at the Online School for Young Shluchim. “He’s learning Code of Jewish Law, Talmud, Torah, Chasidut, Navi and Parsha over the course of a week,” says his father, Rabbi Berel Levertov, Chabad representative to Santa Fe. 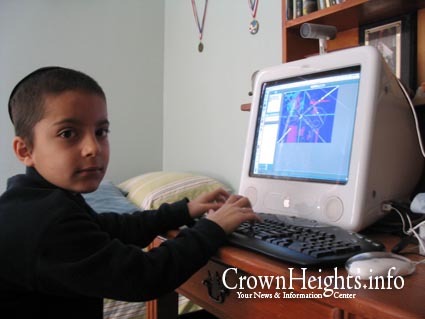 “This is an incredibly innovative program that has allowed me to keep my children at home while giving them the quality of education they would receive at a proper yeshiva or traditional Jewish day school,” says Levertov, who has four out of five children enrolled in the Online School. Until virtual spit balls are invented, teachers at the Online School also enjoy the benefits of the unique and innovative system that eliminates losing time on discipline. When the classroom gets too noisy or out of control, the teacher can simply switch off the student’s microphones. “You can build positive relationships with the students when you are not forced to discipline,” says Chanie Barber, second grade teacher at the Online School. Though the class is only two hours a day, the students seem to pack more learning into less time. There are a few minor glitches to be ironed out, with students sometimes as young as five and six years old getting stuck on technicalities, headsets and microphones. Getting kicked off the server can sometimes mean that the student will miss 10-15 minutes of the two hour class until they get re-admitted. The teachers, too, need to adapt to the new environment. Devorah says that sometimes she feels the class is going too fast for her, but she does not know how to communicate that message. Without the teachers in close proximity, it is difficult for them to gauge the reactions of their students and evaluate the pace at which they understand the information. Yet, students and parents say it is an amazing development. ”My children now have the benefit of being schooled by trained teachers, with the supervision of a principal and the social environment they would get at school. 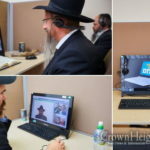 My children now are on the phone and internet with their classmates, and this has opened a whole new dimension in their experience as young Shluchim,” says Mrs. Devorah Leah Levertov. The students, teachers and administrators are excited about the progress they have made and the opportunities that lie ahead. Do the kids miss being in a regular school? “This is a real school!” Devorah insists. This is fantastic!! Is really only for shluchims’ children? What about Anash, who are not shluchim who also live in “out of the way” places. We have to send our young children away to Chabad schools, too, since there are no Jewish schools where we live. Lubavitchers like us who are not shluchim would love to take part in this, too! This school is virtually amazing! And Schneur Jacobs of Burlington is so cute! gr8 opportunity for the rebbe’s shluchim out there!!! This a very good program. go to school they should have a late class program as well. All children that need it can use it, anyone in need would go through the Shliach in his area or closest to them. Just call the Shluchim Office in n.y. 7182210500 and ask for Yuti. It is for shluchim and shluchim supporters (anash) living in remote areas that do not have chinuch al taharas hakodesh. Fantastic article. Well written, informative, great program! BTW. Is the photogenic kid in the first photo a real kid, or did they hire him to make the article classy? Yossi Goodman keep it up, you are doing a fantastic job here at the Shluchim office keeping it going strong for kinderlach from the world over!! is there a site so we can view what they do? Go Chanie Barber! Ur an awesome teacher! 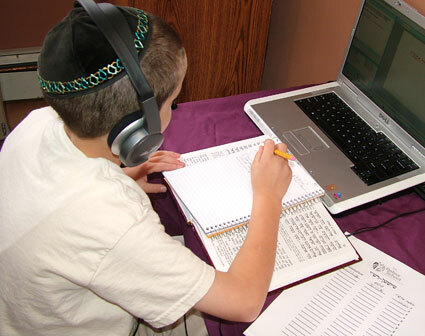 Some classes are at the same time so they do have to use the extra computer in Chabad House or even buy a new one-it’s worth it for such good education! BH this school started so the young shluchim are able to learn in such an amazing way! So, all the kids are adorable, but the first one I know personally, so forgive me everyone, he is so cute! I witnessed him actually in school (on his computer) and it is a truly amazing creation! Thanx a lot to the shluchim office and the shemtov family of new york, i cant imagine of a better way to invest money.. keep it up! Uncle Fishel… I’m sure the kid in the 1st pic was hired… I mean, just look at him! what age does it go up to? i’m a homeschooled high schooler are there are very few resources since most people go away by my age…. Go Shluchim Office!! I would have loved this! This is a wonderful idea. The Rebbe would surely be proud that his little shluchim can have the same learning opportunity as their fellow little shluchim that are living in the big cities. KEEP UP THE GOOD WORK…. Why ther is no mentione of the shemtov Family that support this Project ? and Moshe Shemtov The Director of the on line School ? Give Credit to the people that deserve it. Thank you all Gedalya Moishe, and the rest of the team.